So far, the weather in New Orleans was exactly as expected - hot, humid and some thunderstorms here and there. We got a bit sunburned, drank lots of water, ate lots and thoroughly enjoyed ourselves. Up until our brunch at Commander's Palace, the rain pretty much held off except for a brief one while we were at August. However, we ended up spending our afternoon before our flight back home at Riverwalk since it was absolutely dumping. This was no passing storm and really, we were lucky it came on our last day. Prior to our flight, we decided to hit up something close to your hotel in Cochon Butcher. 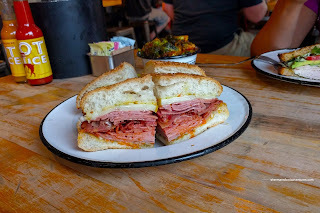 We already had a wonderful dinner at Cochon next door, but at the butcher they are known for their sandwiches, in particular their version of the Muffaletta. At first glance, the sandwich was medium in size, yet definitely generous with the meats. I enjoyed that this was served warm with the oils of the meats activated giving off a salty aroma. The bread was on point being toasted crispy on the outside and soft on the inside. There was just enough olive condiment to give the sandwich some zing and fermented saltiness. This was pretty tasty in my books. 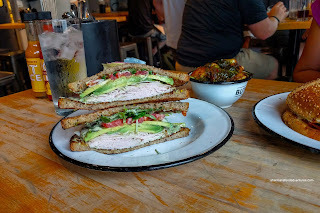 Viv ended up with something lighter in the Smoked Turkey with avocado, sprouts, tomatoes and mayo. This was all served between 2 slices of aggressively toasted and charred whole wheat bread. Hence, there was a smoky and nutty crunchy that gave way to soft ripe avocado and fresh veggies. The star of the show was the turkey though as it was moist, tender and plentiful. Best of all, the smokiness really came through. After the initial bite, the smoke flavor was impactful and lingered to the end. 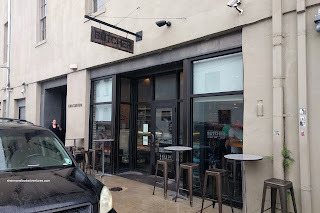 We liked how it was as advertised since some smoked meats are not that strong. Despite this, we didn't find it overwhelming as we could still taste the sprouts. 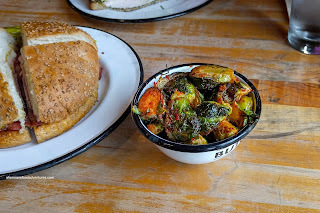 Lastly, we shared the Marinated Brussels Sprouts which were also very good. They were fried just enough to give them a meaty texture while retaining a bite. They were aggressively tossed in a spicy, savory and almost meaty dressing. All the flavors were heard as the seasoning got in between the leaves of the sprouts. There was also a nice smokiness from the deep fry as well. After it was all said and done, we could see why this place is so popular. Too bad we didn't have the appetite to try more sammies!